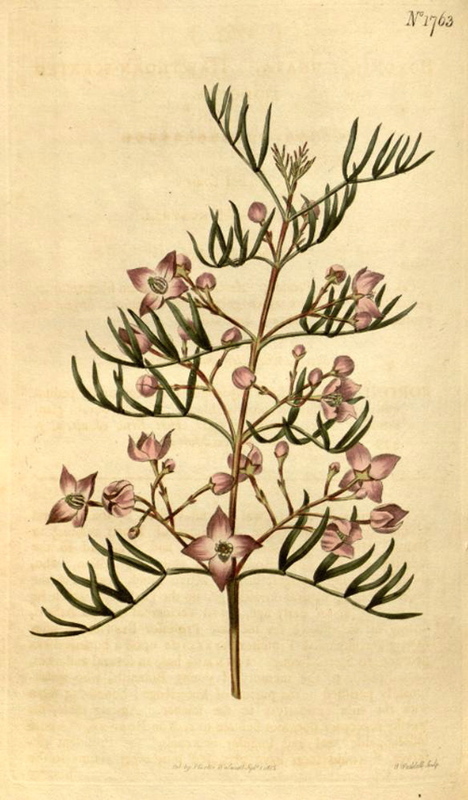 Hortus Camdenensis | Boronia pinnata Sm. Half hardy, robust perennial shrub with pinnate leaves and numerous deep pink flowers in loose axillary or sub-terminal cymes. To 1.5m. [RHSD, FNSW, Blombery, Beadle]. ‘This is perhaps the most elegant plant which has yet been brought from New Holland, that country so peculiarly favoured in its vegetable productions by the Almighty. Doubtless for wise and gracious purposes He has suffered these treasures to remain from the time they were called into existence, until now, unnoticed by human eye.’ [LBC no.473, 1820]. ‘A very elegant shrub, which spreads wide and grows about two feet high, being covered with a profusion of sweet-scented blossoms during a great part of the spring and summer, which remain long in beauty. 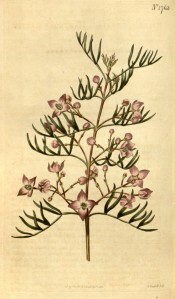 Upon the whole, it appears to us to be one of the most desirable plants that have been as yet introduced from New South Wales. The honour of its introduction is attributed to Messrs. Lee and Kennedy. Communicated to us by Messrs. Loddiges and Sons.’ [BM t.1763/1815]. Introduced to Britain in 1794. [JD]. ABR pl.58/1799. Listed only in the 1857 catalogue [T.168/1857]. Grows chiefly in coastal districts of NSW [FNSW] and probably collected by Macarthur. More details about Boronia pinnata Sm.